T-Mobile is known for offering Valentine’s Day deals every year, and this year is no different. Starting tomorrow, February 10, customers who add a line can get a second line of free service. The line will be covered by a monthly bill credit that’s applied to the lowest cost line added while the offer is available. If you cancel any of the paid lines, the credits will stop. In order to get this deal, you’ll need to be on a T-Mobile One family plan with at least two voice lines. Also of note is that there’s a limit of one free line per account with this offer. This free line deal is stackable with other T-Mobile offers. That means that you can combine it with T-Mobile’s Buy One, Get One deal on flagship smartphones from Apple, Samsung, and LG. Also kicking off on February 10 is an Apple Watch discount. Customers who buy an Apple Watch Series 3 can get a second for half off. This deal is also stackable with T-Mo’s offer of a free line of service. Rounding out the Valentine’s Day deals is a discount on Beats headphones. Right now you can get $60 off the Beats Solo3 ($239.99), $40 off the Powerbeats3 ($159.99), and $30 off the BeatsX ($119.99). 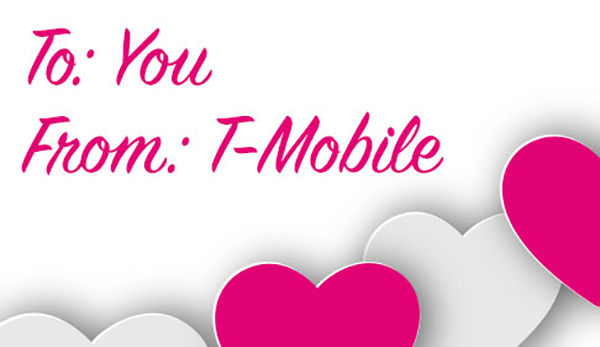 Will you be taking advantage of any of T-Mobile’s Valentine’s Day offers? Does it work for LineLink, i.e. buy one LineLink line get another LineLink free? I wonder what the fine print is on the buy a watch get a 2nd for 1/2 off. 24 month bill credit for $215….lol. Plus you obviously will have to keep the $10 digits plan for that 24 months on both watches to get $215. Basic math tells you who is going to win this deal and it’s not you or me. Here is a question, I am currently on the Simple Choice Promo plan. This deal requires you to be on the T-Mobile One plan. If I switch my plan can I add that 3rd free line right away? They should make this offer available to their Simple Choice plan customers to begin it. That would’ve been nice. Agreed. But they don’t want us on Simple Choice anymore. Too good of a deal for us, especially for those of us with the older promos like adding free lines and family match. indeed. they got a LONG way to go to budge me off that though. 4 lines $100 unlimited and no 480p max (without paying more) for streaming. even with tax that’s $116 here in VA. I’m not sure they can afford to dissuade me from keeping this forever. Short of pulling a Sprint (ancient SERO plan user) and forcing me out by eventually restricting phones that can use it, etc. They sure will.. But your monthly cost will go up because the One plan costs more. That’s right. Look at your current plan right now. How much is it and what is included? Also what’s your main concern? Cost or added features? I was also on the Simple Choice unlimited plan as well until TmoOne gave a sweet promo for OnePlus for free on all my lines. Originally had Simple choice with three lines, added two free lines November 2016, upgraded to TMoOne with OnePlus promo at zero extra, now adding these two lines as well, just to use the 7th line free. And my bill is only $120 (with taxes and fees included) now because I am only using the free lines on my account. 4 give kickback a full $10 per line, even if you use it strictly for voice and messages. I just don’t touch the data. And I get Netflix for free. The value is all there. Just gotta know your plans full details to advise you to switch or not. Keep in mind. All Future promos will only reflect the better TmoOne plan. It is definitely worth the cost. The value is definitely there. I just talked to T-Mobile and they said that to take advantage of this .. it will be a minimum of 4 lines. So you have 4 lines but 3 for free. I have a Simple Choice Family plan with 5 paid phone lines (mine the only one with the old $20 unlimited plan) plus 1 free phone line and 2 free tablet lines. I’m not screwing with anything until at least March 2019 when the 4 GB promo for most of my family lines will supposedly get reduced back to 2.5 GB. TmoOne plan with 2 lines already, add two more, kick back the third line, use the fourth free line, assuming you have auto pay, it’s $130/mo. Senior TmoOne plan: 2 lines already, add two more, kickback the third, use the fourth free line, assuming you have auto pay, it’s $90/mo. Single TmoOne plan customer: add three lines, the promo is for the third and fourth lines. $70+50+20+0=$140, assuming you have auto pay. Less if you discontinue usage of the original first second third lines and use only the fourth free one: $110, have the other lines on reserve and enjoy your free Netflix. Same scenario for wearables. On tmoOne, add a voice or tablet line, add a wearable line, get a second wearable line free, just use the fourth other wearable line and have the third line on kickback. $70+50+15+0, kickback one or two of the voice lines. This is a stupid scenario but is plausable. I currently have 4 lines. If I cancel two can I get a new line and get the fourth line for free? Ask TMobile. Let them tell you no too. Same price but you have two on reserve for use later. Timing is all. Typically you’d have had to cancel the line(s) 30+ days prior to getting in on the free line deals. This prevents people from doing what you want do. I’m in the same boat so don’t feel bad. If you did add 2 more lines and cancelled 2 a few months down the road it still wouldn’t work. Once you have free lines of you cancel any lines you lose the free ones first. Pretty sure all lines besides the free one still get the kick back. You can do what others have already suggested and let your son use the number associated with the free line and get the kickback from the 3rd line that you’re not using. I decided to go for the deal. I added a line for my son to use. Used my free line for a mobile hotspot. Ordered a cheap one off Amazon, and TMO is sending me a free sim for it. Now I will have free mobile wifi on the go. Oh man.. I was hoping you get two voice lines. You get more out of that. Voice plus data.the free mobile wifi wouldn’t be subject to kickback nor would it be able to hotspot beyond 3g speeds. If you had two voice lines, you could use unlimited 3g hotspot from the phone devices anyway, plus be able to use the voice feature. Also there are always walk around for unlimited tethering. Kick back all lines you use. Even if it doesn’t use 2gb you’ll get up to $10 on each line. If you don’t use that third line, you’ll get the full $10 credit. I would give your son the fourth line since it’ll be charged zero dollars. Jeep in mind that the free line credits after 2 months. I’m still enjoying free Samsung A8 Tablet giveaway from V-Day 2016 that required 2gb tablet plan on promo offer 10.00 monthly. Needless to say I will never dump that tablet plan , 2gb for 10.00 can’t be beat. Those were Un-Carrier days that are no more. Does this work to end up with two free lines if I am on the 2 for $100 plus a 3rd line free? My thought is 5 lines with two free but not sure if they will allow it. What do they charge for 3rd line if on 2 for $100 One account? How many GB for hotspot? does anybody know when this offer ends?